With some competitions taking place in the Shire, we think it is good to remind (or warn, that depends) you of the upcoming Dwarf Festival called the Harnkegger Games. This year it sees it's seventh installment. All can be learned from a publication the organisers have brought out, so we'll confine ourselves here predominantly to the parts that take place in the Shire. Monday September 24 the festivities begin with a concert by the Dwarf band the Rolling Kegs at Thorin's Hall. This takes a bit of out of bounds travelling, but might be of interest to our readers. It starts at seven bells ((19:00 UK, 2pm servertime)), so don't be late. Also on Wednesday September 26 and also in the Shire, there will be a fishing contest, expertly lead by our own Master Ponso Pondhopper. The venue is the Isle Pond near Bamfurlong in The Marish. There is a maximum number of competitors, so if you want to compete, best take action quickly and sign up! How to do that is explained in the aforementioned publication. The fishing competition will start right after the swimming contest. 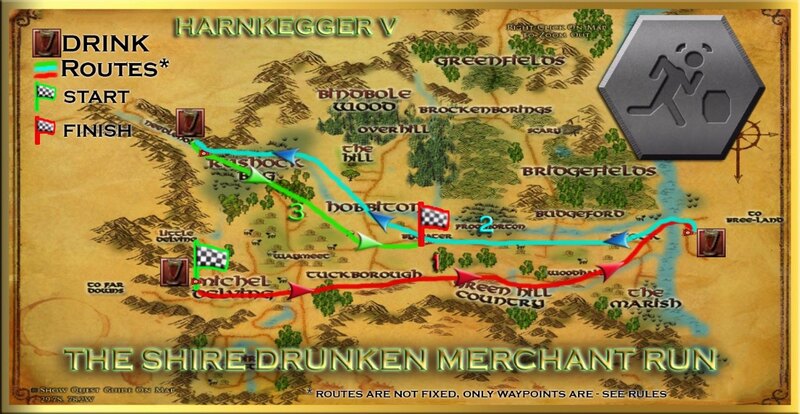 On Friday September 28, THE SHIRE DRUNKEN MERCHANT RACE will be held– A foot race that takes competitors through the Shire and beyond, with plenty of refreshing ales to keep them going. Competitors must run on foot, drinking the listed drink at each waypoint, first one to cross the finish line wins. This is a race that commemorates the trade of the Dwarves in the Shirelands. Anyone can enter, but be aware that the dwarves are very stern when it comes to dealing with cheaters! No means, magical or otherwise are allowed that would make you go faster than you normally would. Hunters, Wardens and others, beware! The race starts at Michel Delving, at the Mathom House (green flag)– Ends at Three Farthing Stone in Bywater (red flag). The highlights on Saturday September 29 are the Walk (Walk, don't run, to the South Farthing Gate) and the Poetry & Story Contest in Hobbiton (Ivy Bush Inn), starting at approximately eight and a half Bells (( 20:30 UK, 3:30pm servertime)). To close off the events, there will be a musical event at eight Bells ((20:00 UK, 3pm servertime)) at the Bree Festival Grounds on Sunday September 30, followed by the Award Ceremonies. You would have had to sign up beforehand to play at this event, but do come to enjoy and listen to the concert. Again, for much more information and the rules for all the competitions, take a look at the official Harnkegger VII brochure. We hope you will have fun competing or watching and we wish all competitors good luck and a fair Harnkegger Games, 2018 edition.